For being a nursery that specializes in clematis, hydrangeas, fuchsias, and perennials, we sure talk a lot about gravel. 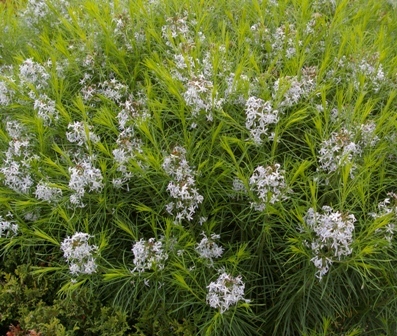 We use it in our pathways, use it to amend our planting beds, and use it as mulch. But what we get asked about most is how we use it on our lawn. When we last treated the lawn at the nursery I did a five month pictorial to show people how this works. It is best to do this treatment during the rainy seasons. So usually October through April are your best times for gravel application If you will be doing compost and overseeding, October, March and April and sometimes May, are the best times. 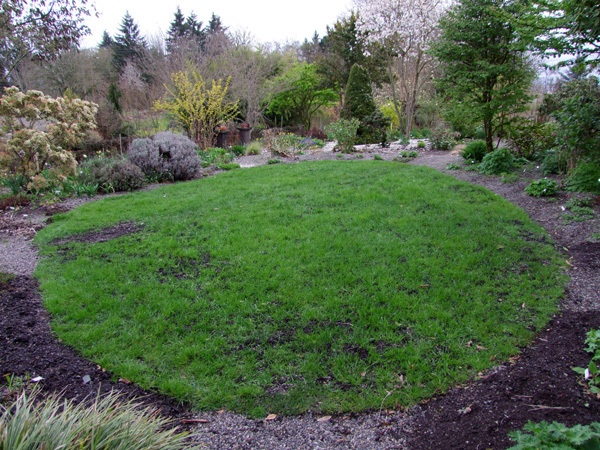 If the existing lawn is very sparse or has existing bare spots compost and overseeding is reccomended. First mow your lawn short and aerate if you want. 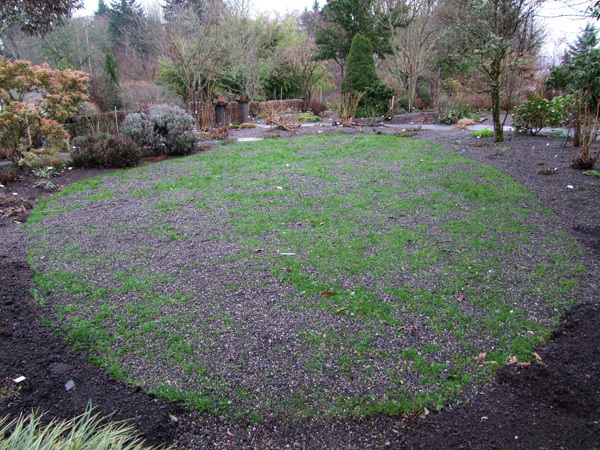 Here is the lawn on January 11, one week after the gravel had been applied. 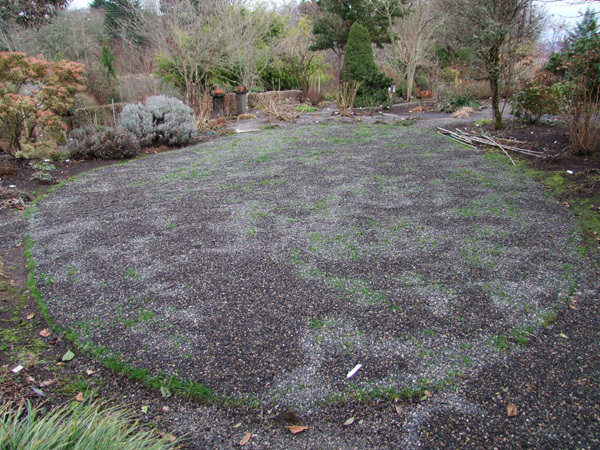 About 3/4 of an inch of quarter ten gravel was spread over the top of the existing lawn. The type of gravel is important. 1/4 10 is crushed basalt that has been washed. Having gravel that is crushed, not round, allows it to travel better through the soil and help improve drainage. You want the washed variety because you do not want to be adding sand to clay soil. We added extra gravel to fill in a low area that is on the far left of the picture. After a few weeks, on February 1 you can see the lawn starting to grow through the gravel. In the last ten years there has been roughly four inches total of gravel applied to this lawn. Due to a warm February, some of the grass has started to grow by March 4, but there are still gravel patches. We apply the gravel for two main reasons. 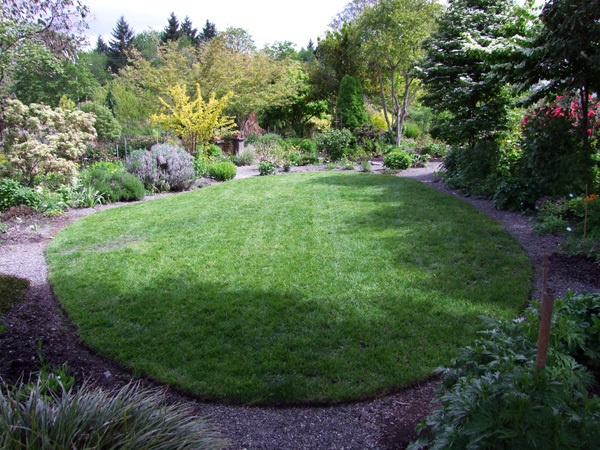 First, it helps with winter drainage so that the lawn does not get mushy and mossy with all of our rain. Second, by breaking up the soil underneath the lawn it lets the grasse’s roots travel deeper whcih in turn allows you to water less in the summer. 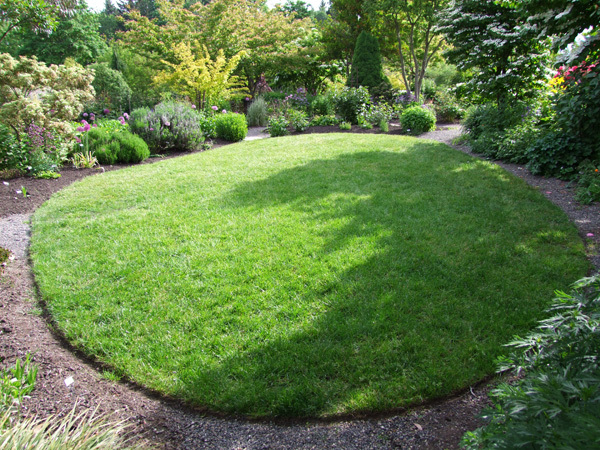 This is a high traffic lawn and certain areas needed extra care. We top dressed them with some organic compost and re-seeded the bare spots. On May 15 it is hard to tell if the gravel has even been applied. This lawn takes a beating all summer, thousands of people walk across it, and is watered deeply maybe once every two weeks and still manages to stay green. This entry was posted in Musings and tagged Gravel, Gravel Lawn. Bookmark the permalink. Great info. Last year I shared your FB post on this subject with my clients and FB friends. But it bears repeating. A couple of years ago I saw a neighbor doing this and I thought “what an idiot” he thinks by putting a thin layer of gravel over live turf he’s going to kill it?…turns out I was the idiot. Never heard of doing this before, learn something new everyday. Thank you for sharing this info. This is wonderful! We work for Pesticide-Free New Canaan (CT) and are always looking for chemical-free tips to pass along to our audience. Thanks! Is this method appropriate for lawns that are solid clay? Yes. The gravel helps to break up the clay. With very heavy clay you will have to repeat the process a few times for best results. I am intrigued! My yard is a clay-based lumpy mess. I just may have to give this a try. Thanks! Are you sure the gravel is 1/4 ten? All I can find is “1/4 minus” which is also sometimes labeled as “1/4 – 0.” Was this a typo/misreading, as I’m interested in doing this for our lawn and want to source the gravel. Thanks! Yes, it is 1/4 ten. You want washed, crushed gravel. 1/4 minus is not washed and has fine particles in it which you do not want to put on your lawn. Unfortunately, 1/4 ten is not available everywhere. You can probably find something similar, but crushed and washed are the important aspects. No sand or fine particles. We dig out about 4 inches and lay landscape fabric down. We then put down the gravel. For a more compacted path you would use 1/4 minus which packs down for a stable base. Then you can put 1/4 ten on top of that for a softer path such as the ones we have in the garden here. All I can find at my landscape supply store is 1/4 pea stone. Is this the same, or similar enough? You want rock that is crushed (has sharp edges) and washed (no fine particles). Pea gravel is usually rounded and will not work as well. We are a small retail nursery in Georgia. i have some 1/4 minus gravel that has been on my path for about three years….I wanted to put a different gravel down as this does not compact as well as I would have hoped (for lawn mowers!). Would this be clean enough now for application to my lawn? I am thinking so….. It should be clean enough. Just make sure you stick with the upper layer. We are going to do this. How do we estimate the amount of quearter-10 to order (for, say, an inch of coverage overall)? And who sells it? Thanks! A note: We generally use about 1/2″ of the gravel as top dress on an existing lawn (up to 3/4″ if we aerate the lawn before application. 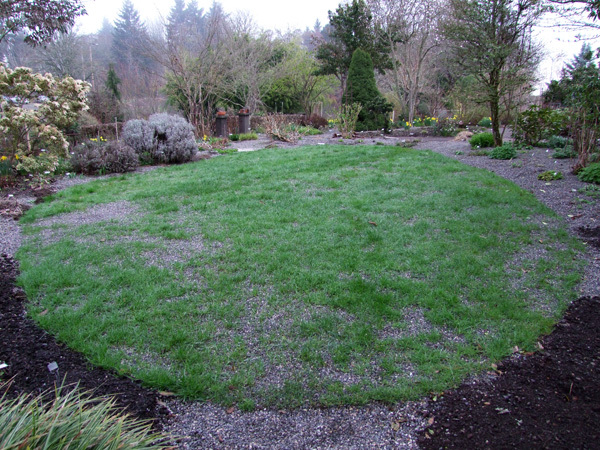 A full inch of gravel over the top of a weak or spotty lawn can kill the existing weak grass. As for Sources: Scappoose Sand and Gravel , Baker Rock, Clackamas Landscape Supply and often times the local Best Buy will have it. I have torn out my grass because there was so much buttercup, lesser celadine, and other weeds. After putting down the gravel, how much compost (and what kind) should I use? I’m in “clayey” SW Portland. Thanks. I’m really looking foward to doing this soon. We generally rototill two inches of a medium grade compost into the soil along with the 1/4-10 gravel. Most often in our area what is available is aged hemlock. If you are making your own compost and have lots that will work also. As a note if your soil is southwest hills blue or cream clay colored it might be beneficial to use 3 inches of the 1/4-10 crushed gravel. Mike, I’m in the SW Hills too like Sue and am looking to redo the lawn for similar reasons. When you talk about using the “aged hemlock” for compost are you talking about the 1-2 year composted medium dark hemlock barkdust that you can get blown in from several local suppliers? Thanks.